During a weekend of events to mark the formal opening of Cohen Quad, the Principal Architect Alison Brooks, Project Architect Hannah Constantine, and Deputy Bursar Gez Wells were on hand to talk about the design and creation of Cohen Quad. Guests were invited to watch the video below and then ask questions and discuss the response of students to living on site. Click on the video below to learn all about the vision behind Cohen Quad and how it was realised. Cohen Quad – The Architects’ Vision from Exeter College, Oxford on Vimeo. Just outside Cohen Quad’s FitzHugh Auditorium is a wonderful, light foyer where people gather before going into a lecture or concert or before attending a seminar in the adjacent Maddicott Room. From the earliest design concepts for this area, the wall facing the Maddicott Room was designed and built to fit the College’s stunning carpet created by its renowned former student, the designer and artist William Morris. Originally believed to be from the Kelmscott Manor estate – home to William Morris from 1871 until his death in 1896 – the carpet was, until recently, laid on the floor of the Rector’s Lodgings. When thinking about how we might tie the history and heritage of the College, which is so evident at Turl Street, into Cohen Quad, the architects proposed that the carpet be hung on public display. Earlier this month this vision was realised when the College maintenance team climbed a scaffold, affixed the carpet to the wall and unrolled it, with the lower portions safely stored behind protective glazing. It is a stunning addition to the building and gives the space outside the FitzHugh Auditorium character and colour, further enhancing this wonderful building. Work at Cohen Quad is continuing apace and is on track to welcome the first cohort of students at the start of Michaelmas Term 2016 – just over five months away! Meanwhile Exeter College’s Rector and Fellows are delighted to announce plans for a grand formal opening, which will take place over the weekend of 18-19 March 2017. This event – exclusively for those who have supported Cohen Quad and the Exeter Excelling campaign – will be an opportunity to celebrate all that has been achieved through the generosity of Exeter’s donors over the last 10 years. The event will culminate on the evening of Sunday, 19 March with a celebration in the Sheldonian Theatre and a concert. There is growing excitement as the College prepares to welcome its first students in Cohen Quad in October this year. There was a wonderful buzz among the student body when the housing ballot took place in Hilary Term and students received confirmation that they will have a place in Oxford’s newest student accommodation next academic year and learned which room will be theirs. Once the students have settled into their accommodation there will be an array of events over the course of the year for all alumni, neighbours, students, fellows and others who are excited about Exeter’s “third quad”. So many people have been involved in bringing this project to fruition and we would like to thank you all and celebrate this new stage in Exeter’s history. At the heart of Cohen Quad will be a café serving hot and cold food and drinks. The café will form a social hub for students and fellows to meet, make friends and lifelong connections, and exchange ideas. It will be named the Dakota Café after the Dakota Foundation, founded by alumnus Bart Holaday (1965, PPE), which has supported the Walton Street development as part of its mission to enhance human capabilities through activities that combine business discipline with charitable intent. Exeter alumnus and member of the Dakota Foundation board Justin Bronder (2003, Astrophysics) visited Cohen Quad in January 2016 with his wife Jennifer (2002, Music) to see how work is progressing at the site. “I remember being briefed on the planned extension of the College and being blown away by the vision,” he said. “I thought about what it would mean to me, if I were a student again, to have amazing facilities like that so close to the centre of Oxford and to the College’s main site. When I thought about what future Exeter students will have I was kind of a bit jealous! “I lived at Exeter House before it was renovated. It was part of the Oxford experience I enjoyed, but you might say it was ‘gritty’! Rector Cairncross came to Exeter a year after I started with a vision and did a great job making that vision reality. Exeter House has now been renovated for members of the MCR and the development at Walton Street is a continuation of that vision, with amazing accommodation for members of the JCR and study facilities for the whole College. Cohen Quad has got all the facilities that appeal to modern, professional students. Today it is students at other colleges who will be jealous of Exeter! Since November 2015 Cohen Quad has been cloaked in weather-proof sheeting. But sadly what keeps the elements out also keeps prying eyes at bay, and the progress at Exeter’s third quadrangle is no longer immediately obvious to the passing observer. But behind the façade of plastic sheeting progress is continuing apace. Currently the exterior windows are being installed – known as a curtain wall in the construction industry as they form a non-structural exterior to the building. And behind that curtain much work is taking place inside the development too. Both of the passenger lifts are under construction, with Lift 1 already having its door in place. Underfloor heating is being installed in the basement and the ground floor. The remaining floors will also benefit from underfloor heating in due course. Also in the basement mechanical and electrical work is being undertaken, including the installation of the building’s boilers and an air source heat pump which will transfer heat from outside to inside the building, providing an efficient and environmentally friendly way to heat Cohen Quad and its water. So while from the outside it may be hard for the casual observer to notice much change, inside Cohen Quad great strides are being taken towards the development’s completion ready for its first students in Michaelmas 2016. On 4th December Deputy Bursar Gez Wells conducted a tour of Cohen Quad for a small group of current students. Before entering the building site itself, the visitors were given an overview of the vision behind the new quadrangle by Hannah Constantine of Alison Brooks Architects. During the tour, the students were shown every space at Cohen Quad, from the Fellows’ and Junior Dean’s sets high up on the fourth floor down to the archive and reading room in the basement, as well as all the bedrooms, teaching rooms, and study and relaxation spaces in between. “I am so glad to have had the opportunity to see Cohen Quad. What struck me the most was the sheer size of it! It was really great to be able to walk around and understand how all the different spaces flow on from one another. I found it so impressive that the goal of effortless functionality justifies every detail. The design is an absolute feat, and yet I couldn’t imagine it any other way; it’s truly seamless. The College intends to carry out several more hard-hat tours during Hilary and Trinity terms 2016, offering many more students, staff and Fellows the opportunity to explore Cohen Quad ahead of its completion in late summer 2016. The Ruskin School of Art, part of the University of Oxford, was opened by John Ruskin in 1871 as the Ruskin School of Drawing. It offers a Bachelor in Fine Art degree for undergraduates and a Masters and DPhil in Fine Art for postgraduates. It has two sites, 74 High Street and 128 Bullingdon Road. Exeter welcomes one Fine Art student per academic year. The Ruskin School of Art has no direct connection to Cohen Quadrangle. In 1899, Ruskin College (originally Ruskin Hall) was founded in the city of Oxford, independent of the University. It “aimed to provide university-standard education for working class people to empower them to act more effectively on behalf of working class communities and organisations such as trade unions, political parties, co-operative societies and working men’s institutes”. Its alumni include British politician John Prescott, Kenyan civil rights advocate Tom Mboya and Siaka Probyn Stevens, Prime Minister and President of Sierra Leone. 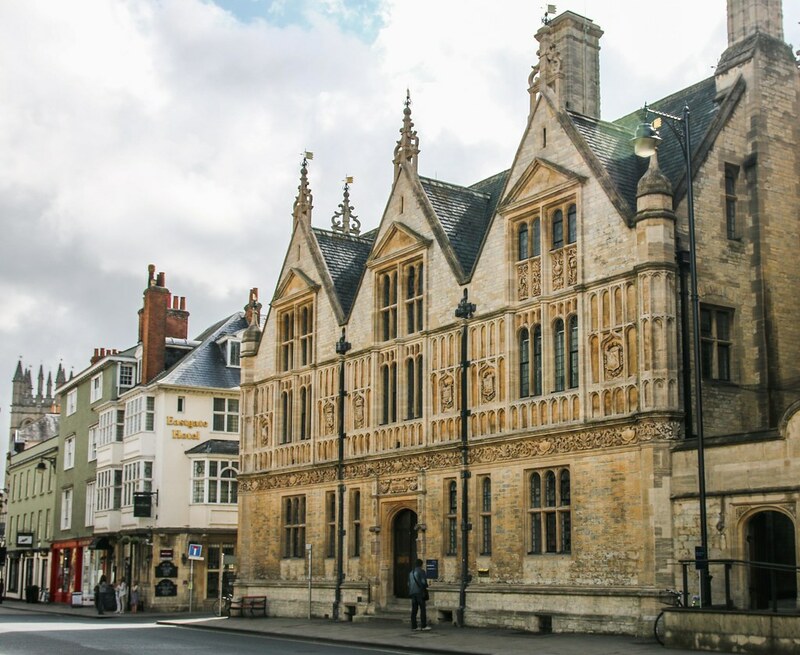 Ruskin College is now an affiliate of the University of Oxford, which ensures that its students can access many University facilities such as libraries and social spaces, as well as academic and extra-curricular events and societies. Ruskin’s campus is in Headington, East Oxford, but its original site was on Walton Street. Its grand red-brick Victorian building was completed in 1913 and various extensions were added over the next 60 years. This is the site that Exeter College purchased in March 2010. After the Second World War, an even closer link between the two colleges developed, when Exeter offered a place each Michaelmas term to an entrant from Ruskin to read for an undergraduate degree. You can read about the experiences of Ruskin and Exeter alumnus Tony Moreton (1952, PPE) on pp26-28 of the Exeter College Register 2011. Exeter College took official possession of the site in October 2012 and all of Ruskin College’s activities were relocated to its newly-renovated campus in Headington. We hope that this helps to explain Exeter’s history with Ruskin College and that any confusion between the two Ruskins has been cleared up. Of course, if you have any questions please don’t hesitate to be in touch. Finally, fear not: we’ll be back to bricks and mortar in our next Cohen Quad update. Sources: Ruskin College website; The History of Ruskin College by Harold Pollins (1984); Oxford History website; Wikipedia; Ruskin School of Art website; Exeter College Register (2011).